Hello and welcome to the Stamp Review Crew Blog Hop! This week's stamp set is the very versatile: Sprinkles of Life. Not only is this set wonderfully cute, but it also helps a great foundation, as part of the proceeds are donated to the Ronald McDonald Charity House. If you're already hopping, then you just came from the talented Yapha Mason's blog. If you're just stopping in, no problem! Just start here and hop on through following the stamp review crew's buttons. So as I mentioned before, the "Sprinkles of Life" stamp set is crazy, versatile. There is so much play room with this set and did I mention it has a co-ordinating punch!?! I love how you can create an ice cream cone, a cupcake, a tree, an apple tree, a rain cloud, a branch, a basket and so much more with just one stamp set! 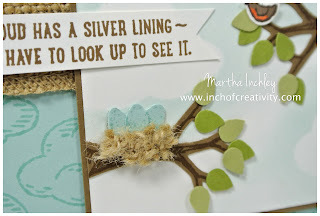 For my card today, I decided to create a sky view, with tree branches. I told you it was versatile! First I started out by masking off some clouds. I used the coordinating Tree Builder punch for the cloud shape and sponge daubed Soft Sky ink all around them. I love this technique! I added in two branches: Soft Suede ink on Soft Suede cardstock and teardrop leafs of Pear Pizzazz and Old Olive cardstock. The stamp set comes with a cute little birdie and I thought this mama bird needed a nest, so voila! Do you like my robin eggs? I created them with the punch as well, i just trimmed the tear drop and added in some speckles with my pool party marker on to the Pool Party cardstock. The nest is created with the 1-1/4" Burlap Ribbon. All I did was frayed and frazzled it a whole lot and then tied it up into a little bunch. So Cute! To finish my card off and to make my card and greeting work together, I repeatedly stamped the cloud image in Pool Party ink onto Pool Party cardstock. Very cute card, Martha. Love the bird keeping an eye on the nest from the adjoining tree! Spectacular! I love the branches, the burlap nest with perfect little eggs nestled in and the punch used for the leaves too! So creative! Love how you created a sweet summer scene with clouds and branches.....and birds! The nest is adorable! 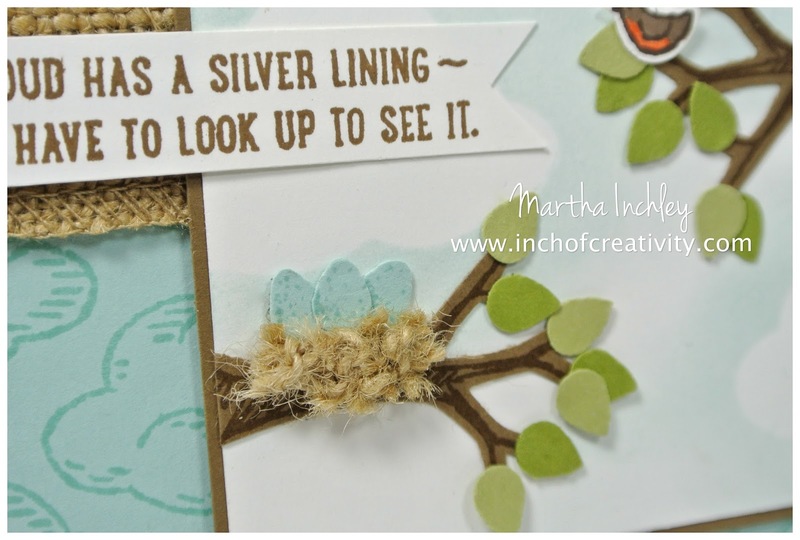 Gorgeous card, Martha! I love that nest and how you turned that tree into branches. I adore this card! I love the way you created clouds in 2 different ways, and the raindrop punch turned into leaves! So very smart! Oh my word, I had to pin this one; love your leaves and eggs in the nest - such attention to detail. Oh this is adorable! I love the how you both stamped and sponged the clouds- great contrast! That is adorable! I love the little drops turned into eggs. Super cute!!! The little nests are adorable. TFS! Your card is soo cute and quite creative; it's just adorable! This is an adorable take on this stamp set. LOVE IT!! 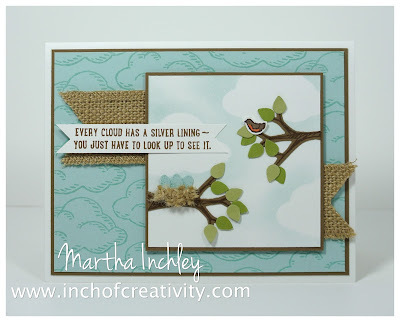 Martha, your clouds look light as air and what a clever way to use the tree stamp! I love it! The bird nest is the “Cherry on the ”branch“! What a cute card Martha. I love, love, love that cloud background! Thanks for sharing your creativity! Love that mama bird and her nest of eggs! such fun details on your card too!